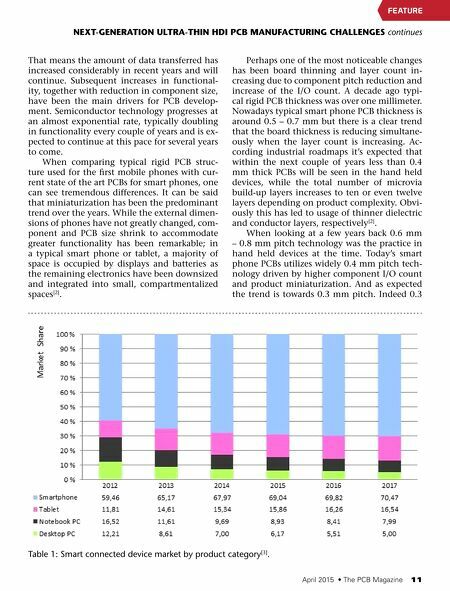 April 2015 • The PCB Magazine 11 That means the amount of data transferred has increased considerably in recent years and will continue. Subsequent increases in functional- ity, together with reduction in component size, have been the main drivers for PCB develop- ment. 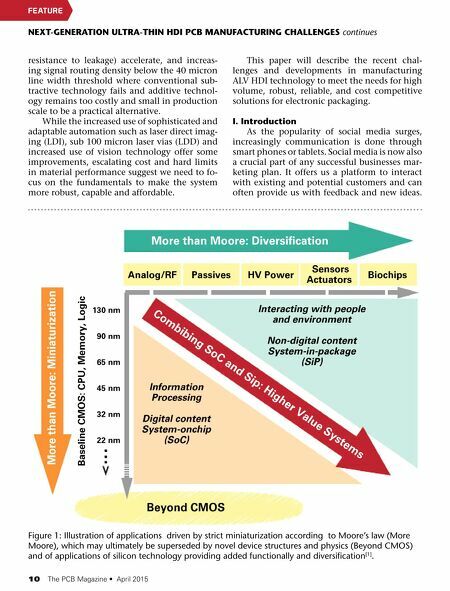 Semiconductor technology progresses at an almost exponential rate, typically doubling in functionality every couple of years and is ex- pected to continue at this pace for several years to come. When comparing typical rigid PCB struc- ture used for the first mobile phones with cur- rent state of the art PCBs for smart phones, one can see tremendous differences. It can be said that miniaturization has been the predominant trend over the years. While the external dimen- sions of phones have not greatly changed, com- ponent and PCB size shrink to accommodate greater functionality has been remarkable; in a typical smart phone or tablet, a majority of space is occupied by displays and batteries as the remaining electronics have been downsized and integrated into small, compartmentalized spaces  . Perhaps one of the most noticeable changes has been board thinning and layer count in- creasing due to component pitch reduction and increase of the I/O count. A decade ago typi- cal rigid PCB thickness was over one millimeter. Nowadays typical smart phone PCB thickness is around 0.5 – 0.7 mm but there is a clear trend that the board thickness is reducing simultane- ously when the layer count is increasing. Ac- cording industrial roadmaps it's expected that within the next couple of years less than 0.4 mm thick PCBs will be seen in the hand held devices, while the total number of microvia build-up layers increases to ten or even twelve layers depending on product complexity. Obvi- ously this has led to usage of thinner dielectric and conductor layers, respectively  . When looking at a few years back 0.6 mm – 0.8 mm pitch technology was the practice in hand held devices at the time. Today's smart phone PCBs utilizes widely 0.4 mm pitch tech- nology driven by higher component I/O count and product miniaturization. And as expected the trend is towards 0.3 mm pitch. Indeed 0.3 NExT-GENERATION ULTRA-THIN HDI PCB MANUFACTURING CHALLENGES continues FeAture Table 1: Smart connected device market by product category  .